Family picnics, romantic picnics, group picnics, summer picnics, winter picnics, the list can go on and on. The one thing that is essential no matter what kind of shindig you are preparing for however is the possession of a picnic basket. It might be an obvious statement but it sometimes gets overlooked how much our picnic basket does for us. First and foremost it’s a basic storage device. Anything and everything from our picnic food, blanket, refreshments, flatware, plates, condiments, hygiene products, and entertainment can be stored in our baskets making what could potentially be a tricky journey to the picnic site a whole lot simpler. The picnic basket can serve other functions as well such as insulating your food and drink to achieve desirable temperatures, waterproofing against the elements. And in some cases freeing up your hands so you can keep hold of little ones. The picnic basket will not offer everything to everyone, however. Each will be designed for just a couple of functions in mind. So deciding which basket best suits your needs is an important decision. Luckily, here at Go Shindig, we aim to condense the mountain of choices available to you down to a select few “best in class”. 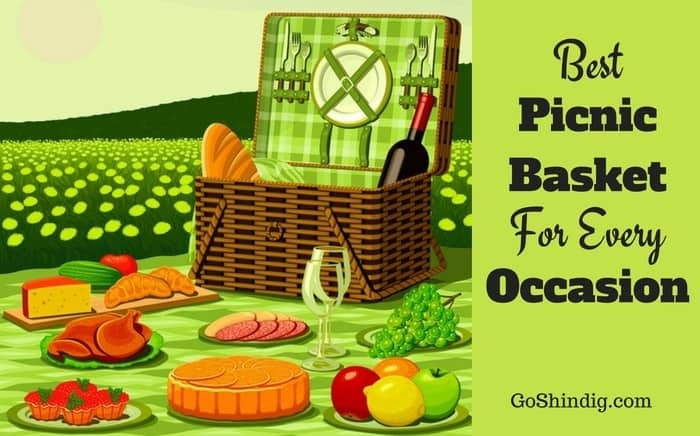 Please read on for some of the best picnic basket ideas we have come across. Sometimes, participating in our favorite past times becomes difficult due to financial constraints and picnics are no different. The sky is basically the limit when it comes to how much you can spend on food and accessories. But thankfully this is not a prerequisite. For relatively little money you can own a picnic basket that serves its purpose more than adequately. This enables you to get out there and enjoy your day with loved ones. The Sprucebay Insulated Picnic Basket from AspenBox wins this section hands down. This 17x9x9 basket is collapsible for easy storage yet when filled with all your picnic needs it is capable of holding 65 lbs of weight. It possesses food grade inner linings that insulate your food and drink from outside weather conditions. Thus keeping hot food hot and cold food cold. Due to its waterproof capabilities, this picnic basket is also easy to clean. So all those spills and stains are a lot less of a worry. Best of all though is the price. At just over 20 bucks this basket gives you all the functionality of one four times its price but it does miss out on all the extras like plates and flatware. The Topanga Insulated Cooler Tote provides basically the same features as the Sprucebay and because it’s a tote you know that storage is not an issue. Insulated and waterproof, this basket can certainly claim to be functional. If there were to be a downside it would be that you might struggle to fit larger items in the bag due to the design of the zips but it must be stressed that this only applies to the largest of items like casserole dishes. For everything else that you would consider normal picnic fare this picnic tote handles them with aplomb. Picnics for 2 invariably lead you to think of romantic getaways between people in love. It is the most intimate form a picnic can take where timing and planning are essential if you are to create the perfect tryst. The best picnic baskets for 2 must, therefore, have an assured quality about them. They must be functional whilst packed with accessories to make the day a truly special one. 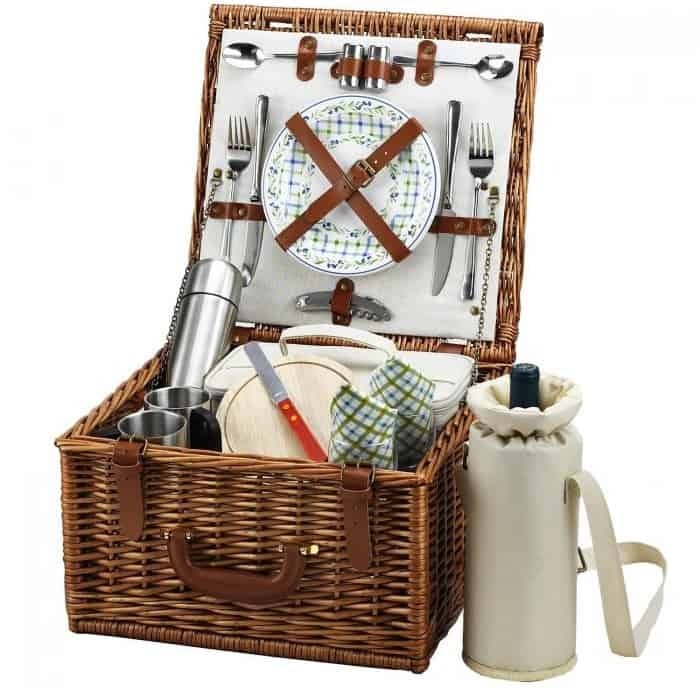 There are more expensive sets available than the Cheshire English-Style Willow Picnic Basket set by Picnic at Ascot but none with the consistent quality shown in each piece that makes up that set. It boasts stainless steel flatware, 17oz SS vacuum flask and coffee mugs, 8” ceramic plates, wine glasses, wine cooler, napkins, a waiters friend, a cutting board, a cheese knife and even some spill proof salt and pepper shakers. Phew. All this is held tight by good quality leather strapping as is the exterior of the basket. Best of all there is a lifetime guarantee which comes with the basket. Whilst there are more expensive sets than the winner available there are definitely some cheaper options as well. 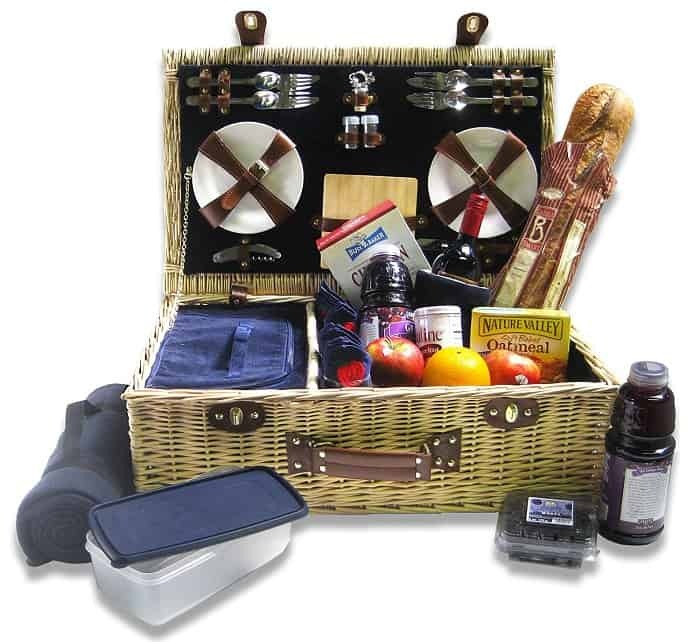 The Deluxe 2 Person Traditional Wicker Picnic Basket by VonShef is one such offering. It might be missing the vacuum flask but they can be easily picked up for cheap and the flatware might not be fully SS but at the end of the day they’re just knives and forks right? What this set does have going for it is that there is a waterproof blanket included. And visually it looks stunning with its blue plaid interior. This is not the number one seller on Amazon for no reason. For a very good price, you get a picnic basket that is full of features. Whether it’s a group of friends or a fun-filled family day out the need for larger picnic baskets is one that is becoming more prevalent. As we are catering to more people, so our basket must be able to stand up to the extra rigors that we place upon it. When it comes down to it though, all this really means is that we need bigger and stronger baskets. The Classic Wicker Picnic Basket by Picnic Pack USA combines all the features you come to expect with a quality basket. But also comes with added bonuses such as a separate insulated section and a fleece blanket. What is so noticeably different to other baskets is its size. Coming in at 25x17x9, it ensures that you will never go hungry or thirsty on your day out with the amount you will be able to stuff inside it. Scuddles have come up with this Insulated Picnic Basket that provides immense convenience at an extremely cheap price. It houses all the extras like plates, flatware, corkscrews, glasses etc in a separate side pocket. This leaves the rest of the bag for your consumables. The insulated basket also gives you the option of carrying it in your hands or over your shoulder. There’s a choice of straps which makes it an ideal option if you have little ones to look after. Obviously, at the price, you are not going to find your plates are bone china. And in the case of this basket, there’s a certain plasticness about all the extras. But this is ideal if you are using this as a family picnic basket and have small children. If you don’t have kids and wish to replace the extras with better quality items that you and your friends can put to better use then this is also achievable. Picnic baskets that you can throw over your shoulders will always hold certain advantages over their more classically designed counterparts. As discussed before in this article, the advantage of being hands-free when chaperoning kids is massive. Weight distribution distributes more evenly over your body with picnic backpacks. So if you have packed an especially large banquet for your day out you won’t look like you’re likely to tip over at any moment. The Picnic Backpack For 4 by Ferlin offers all you could possibly need for your day out. 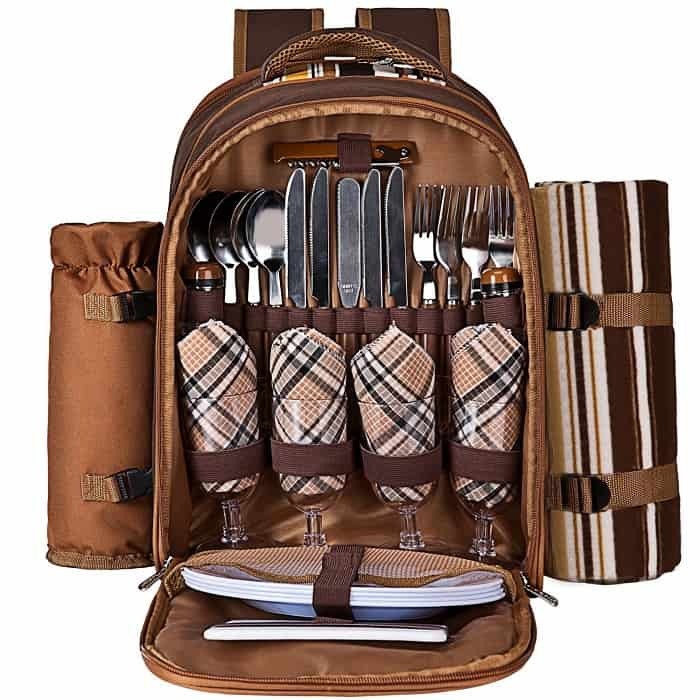 It comes with 9” dinner plates, napkins, wine glasses, salt and pepper shakers, a cutting board, a butter knife, bottle opener, a fleece blanket whilst also boasting of a cooler compartment and an insulated detachable wine cooler. There’s not much variety in the world of picnic backpacks. You tend to find the same features and extra included in most of the sets. Our runner-up here is no different. The Deluxe Equipped 2 Person Picnic Backpack just gets the nod as our runner-up due to the overall aesthetics and attention to detail it showcases. The London plaid is a definite eye-catcher. And the use of wood in the extras certainly makes a change in this genre of picnic backpacks.